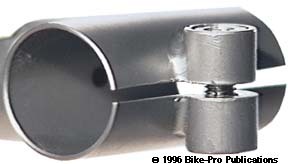 MRC has been a leader in implementing Titanium manufacture for bicycle parts. 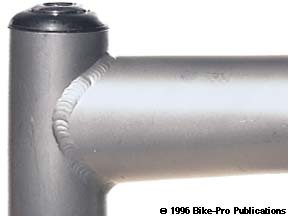 Their stem was one of the first to eliminate steel in favor of Titanium. The quill is made using 1.59mm, (.0625" or 1/16th inch) wall thickness Ti-3-2.5 tubing. 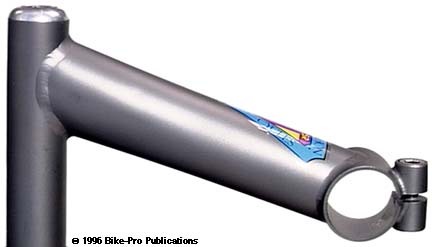 The extension and binder tube are made of a slightly thinner 1.33mm (.0525") wall thickness Titanium tubing. The quill and Binder tube are de-burred by hand after cutting. The extension tube is ovalized, so that the tube is taller at the quill and wider at the binder tube, providing a larger surface of contact for the TIG, (Tungsten Inert Gas, a style of Gas Tungsten Arc or GTA weld), weld joints. The quill and binder are drilled with small holes, that face into the extension when welded, to relieve internal heat build-up during the welding process. The welds on this stem are so extraordinarily clean. It's difficult to imagine the steadiness someone's hand must have had in creating this stem. The binder fittings are machined from a piece of Titanium rod. The backside of the fitting is rounded to contour to the shape of the binder tube. The fitting is drilled and tapped for the binder bolt before it is TIG welded to the binder tube. Once welded to the front of the stem, the binder tube is carefully sawn through to create the cinch type, binding system. The stem requires a separate cable hanger from the headset, (Ritchey, Dia Compe, or Syncros) to drop the cable for cantilever. At the top of the quill is a machined, Silver un-anodized, aluminum cap piece that closes off the top, recesses and seats the head of the expander bolt. The 134mm, long expander bolt is made 6Al-4V Titanium, has a 6mm hex head fitting, with a 8mm by 1.25mm thread pitch. The expander bolt weighs 30.5 grams. The wedge is made of extruded, cut, then threaded aluminum. The binder bolt is made of stainless steel, has a 5mm allen head, with 6mm by 1mm thread pitch, and is 15mm long weighing 6 grams. The MRC stem holds 25.4mm diameter handlebars, is made in the 1" diameter only, and comes in 115mm with a 15¡ rise, 125mm with a 10 degree rise, 135mm with a 5 degree rise, or 145mm with a 5 degree rise. 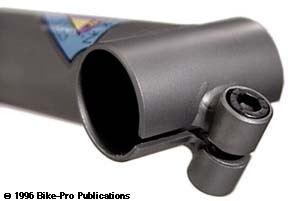 MRC has a Road stem avaiable in 4 lengths for the road rider. 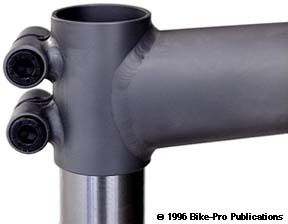 Using the same Titanium tubing, binder and weld techniques, the Road model is made to hold a handlebar having the standard 26.0mm road bar center diameter. The road model is available in a 1" diameter only in 100mm, 110mm, 120mm, or 130mm lengths. It had limited avaialbility. To satisfy the threadless crowd Steve Mc Mahon has two Ahead stem models. 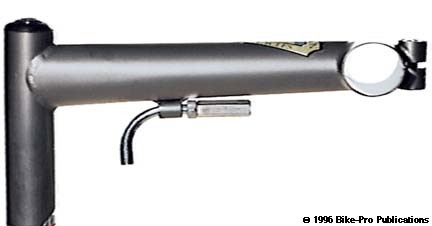 The Ahead models use the same extension and binder tubes, with the same binder fitting and bolt. In place of the quill tube and expander bolt, a vertical tube is welded. This 1 3/4" long vertical tube is made of 1.48mm wall thickness Titanium 3Al-2.5V tubing. The clamp to the steerer tube is made welding two the binder fittings horizontally to the back of the vertical tube, then sawing through the tube to make the double cinch mechanism. The fittings are spaced 12mm from each end of the vertical tube. All three bolts are made of steel. The MRC Ahead stem holds 25.4mm diameter handlebars without shims. It comes in two lengths, 135mm and 145mm both have a 5 degree rise.